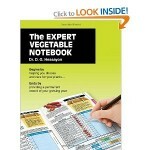 How can books help your vegetables grow? I’m a glutton for information, but … oh well, hear the confessions of a Kitchen Gardener. Maybe it’s that I don’t have enough confidence sometimes, and want some expert to put me straight on how to do things correctly. Let’s face it, when you take a seed packet, prepare the soil for the seed tray, sprinkle the vegetable seeds in – (“Oh heavens, is it lightly on top, 1 centimetre deep, or 2 centimetres deep? What if I do it wrong? Better look in the book, just to make sure.”) And that’s why I still use gardening books! Just a personal point (another confession) – do other gardeners feel the same as I do when I have successfully grown 35 tomato plants from seed (I thought I’d sown only 15 seeds in the seed tray – but that’s gardening for you). Unfortunately my greenhouse and garden has only got space for 12 Tomato plants. So what do I do? I desperately try and give the spare plants to family (even those who manage to kill off every plant I give them), friends and passers-by (it gets so bad that I feel like going up to strangers and saying “Please take the plants. I’ve nurtured them from the beginning. No? Why not? Look, have the damn thing, that’s an order – we can’t waste it and I can’t just kill it!“) But at the end I still have 4 plants left, which look surprisingly strong, better than the ones I’ve planted in my Kitchen Garden, maybe the best of the bunch. I refuse to dump them on the compost heap, or tip them into the rubbish bin – it just doesn’t seem right. Absolute sacriledge. Wow, got that off my chest. Having a blog is, sometimes, like having a sympathetic councellor. I feel better for that. OK, where was I. Books. 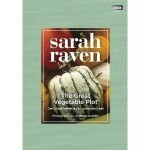 My favourite gardening writer is Sarah Raven with her book, The Great Vegetable Plot, for inspiration, beautiful pictures and the fact that she has made me think ‘out of the box’ re. 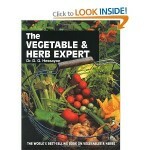 unusual vegetables, herbs and combinations of flavours. But alongside Sarah, I also keep the classic books by Dr. D. G.Hessayon, The Expert Vegetable Notebook, and The Vegetable & Herb Expert – books which have been around for years, updated and probably found in every allotment-holders shed, thumbed through with muddy fingers and invaluable in their content. I have just bought myself a new copy of each one, because I’ve read that after all these years of instruction for new and even experienced gardeners, they are not going to print them anymore. More sacriledge!! Maybe it’s because they are not filled with glossy photographs, or Dr. Hessayon hasn’t a TV programme, but they are still the best, simple factual books (and cheap) to help those of us who love to grow and eat our own vegetables. And let’s face it, for a variety of factors, there’s a lot more of us about nowadays. If you would like more information, read reviews or buy these books, just click on the titles in my post.